Hungary, a beautiful country in Central Europe, is literally one large and continuous game preserve. The country has an outstanding role in European hunting tourism, as indicated by the high number of foreign hunters visiting our country each year. In Hungary the game is the property of the state while the hunting territories are either in private property or state-owned, like forestries. The later ones may have territories over 240.000 acres (100.000 hectars), where hunting is just a branch of their wide economic activity. 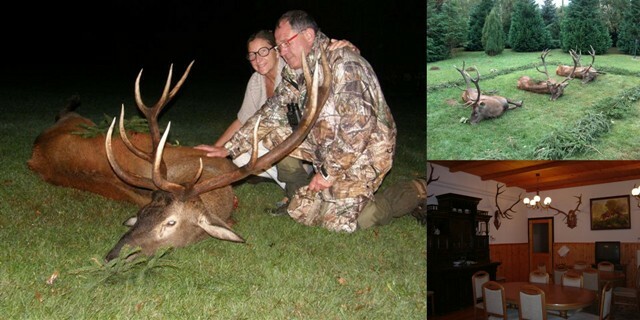 These forestries have got luxury hunting lodges and high quality services. Aside the state-owned forestries there are also hunting clubs, which usually rent their hunting grounds from private landowners. They take care of game management according to a framework of strictly prescribed rules. They also have to do business in order to cover the costs of game preservation and feeding during winter. Such a territory cannot be smaller than 7300 acres (3000 hectars). These hunting clubs also offer first class accommodation, excellent food and the warm hospitality of the Hungarian people. It is important to know that in Hungary most of the game stock lives free, in their natural surroundings. Some forestries formed so called „game preserves” in their territories as well, especially for wild boar. The daily bag in such a wildboar preserve can exceed 30 boars, but of course the bag can be adjusted to hunters’ wishes. Concerning pheasants, the natural population is increased in many regions by setting out 6 week old chickens. 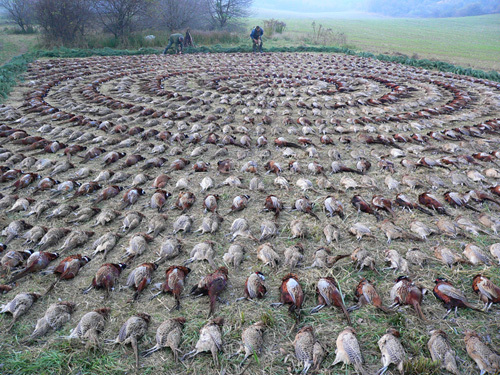 By making use of this method a daily bag of even 600-800 birds can be achieved and this is the secret why the Hungarian driven pheasant shooting is perhaps the most exciting type of driven bird shooting to be found anywhere in Europe today. These birds fly fast and high, offering a great challenge to even the best wingshot. In case of hunting guests arriving with companions (with family for example) Diana Hunts can arrange cultural, shopping and wellness activities in the famous Hungarian thermal baths for them for the duration of the hunt. Another popular choice is usually a 2 day excursion to Vienna or the Czech capital Prague. This way a Hungarian hunting trip may become an adventure for everyone. The red stag is the king of the Hungarian forests and it’s ruttime is a virtual festival for most hunters. 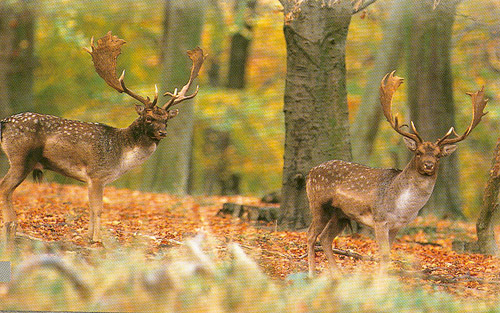 One of the world’s finest red dear stock can be found in Hungary, especially in Southern Trans-Danubia. A Hungarian trophy, weighing 30 lbs (14.50 kg, 271 international points), led the world record list for several years. The stag can be found throughout the Hungarian mountain ranges, but the strongest specimens, the record trophies come from the South-West. The rut begins in the first days of September in the southern parts of the country, and a couple of weeks later in the northern regions. 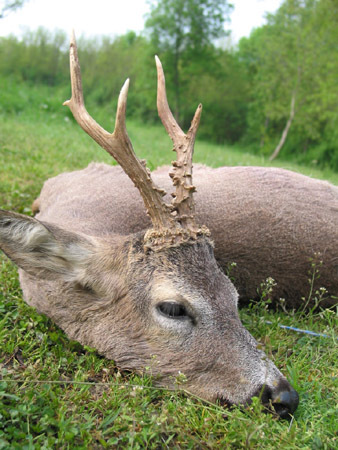 The outshot is done after the rutting season, from November to January, when the weaker and degenerate animals can be shot from high stock or horse-drawn carriges. The Hungarian red deer stock is therefore capable of satisfying any need, both in time and in choice. A species of game which can be found in large numbers (more than 250.000 specimens) throughout the country. It’s main habitate is Eastern- Hungary, but some record trophies have been bagged in Southern-Transdanubia too. Trophyweights exceeding 20 ounces (600 gramms) are not rare, and there are two Hungarian trophies among the first three on the world record list (231.53 and 230.79 international points). The hunting season begins on the 15th April, when the antlers are already glossy and the crops don’t hide them. It is a great hunting experience to stalk through the summer forest, after the old “ghost- bucks”. The Hungarian fallow deer stock is on the same high quality level as the stag, especially south-west of lake Balaton, where many world record trophies have been bagged. The stock is well developped, the trophyweight is often more than 8-9 lbs (4 kg). The world record list is currently led by a trophy weighing 5.80 kg (233.11 international points), bagged in Hungary in 1993. Stalking is the most typical way of hunting, which requires great patience and attention. The mouflon introduced from Corsica, was enshadowed for a long time by the red stag, fallow deer and roe-buck stock, which produced many world record trophies. 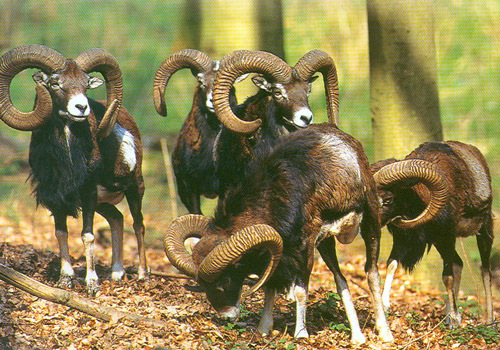 But in 1986, a royal ram with 41 inch (104 cm) long horns was bagged in Telki near Budapest. This trophy reached 10th position on the world record list, and it drew the attention of the hunting society to the Hungarian mouflon. The largest stocks are in the mountain regions, but it can also be found in forested hills as well. Stalking is the most common method of it’s hunt, which is a real sport performance in the mountains, but horse-drawn carriage or jeep can be granted at request. 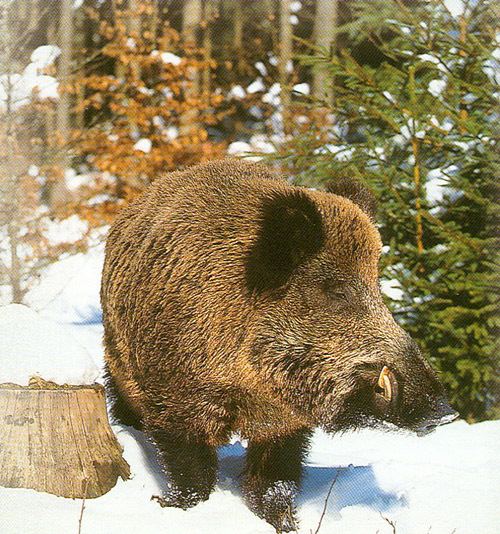 The wild boar is quite common in the Hungarian forests and can be hunted all year with the exception of sows with piglets, which are protected in winter and spring. Stalking in the fresh winter snow or in the summer wheat fields is a highly enjoyable form of hunting wild boar, but it can also be shot from a highseat. The greatest adventure though has to be a well organized fast paced drive, with a sufficient number of beaters and specially trained dogs. This kind of hunt is big challenge to even the most skilled shooters. A driven wild boar hunt can be organized only in December and January. The pheasant, being the most wide-spread winged small-game, can be found in almost every part of Hungary, both in the mountain ranges and lowlands, and it’s hunt has many traditions. The British invented the sport of driven pheasant shooting, but according to many experts the Hungarians are beginning to set new standards of excellence in this dynamic form of shooting. Hungarians have been organizing driven pheasant shoots since the beginning of the 20th century with ever increasing skill. But things are done quite differently than in England. 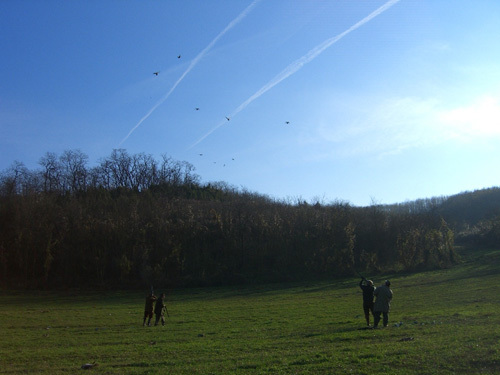 Game managers and shoot organizers in Hungary try to put so many birds in the air at a given time that the guns, no matter how swift and skilled, cannot possibly harvest more than a fraction of them. In England, that might be an unpardonable sign of mismanagement, but in Hungary, the continuing onslaught of great clouds of birds is so impressive that no one seems to complain – even though the overwhelming majority of them pass through the line of guns unscathed. We suggest this type of program to be realized in November for a daily bag of minimum 1000 birds with 12 experienced shooters. Each shooter has a Hungarian loader who is usually an enthusiastic hunter himself, and he carries his guns, shells, and other equipment between drives, and loads for him when shooting. Twelve is the preferred gauge, but 20-guage, 16 guage ammunition is also available in Hungary. According to the demand of the shooters, the hunts can also be organised as a walk-up, or maybe combined with hare or duck as well. The territory is chosen by Diana Hunts, according to number of guns and requested daily bag. Despite the change in habitats and agricultural technology, the hare stock in some regions of the country is still significant. It is most common to shoot hares during a walk up hunt, but with 8 to 10 guns a traditional hare hunt may be succesfull as well, reaching a bag of several hundred hares is not impossible. A traditional hare drive can be tried after the harvest, on undulated agricultural land with spots of shrubbery, where the beaters, lining up in a U shape, can drive the hares towards the hunters from a sufficently large area, thus enabling the hunters to shoot safely. Many different kinds of wild ducks can be found in Hungary, but not all of them can be hunted. It is therefore very important to be sure what kind of duck one is aiming at before pulling the trigger. Among the huntable species the mallard is the most common, but the common teal, the garganey, the pochard and the goldeneye may also be hunted. Hunting methods may include hunting from the shores of the lake, or for a larger group a beating can be organised as well. Although most doves in Hungary are protected species, the collared dove’s hunts is still permitted due to the damage it does to agriculture. This bird and the huge sunflowers fields are unseperable. Shooting them is not a thing to undermine, since hitting this fast flying, small bird is quite an achievement. A good shoot can bag more than a hundered doves a day. The woodcock, the bringer of spring, is probably the most exciting wing-game to hunt, thanks to it’s small size and fast flight, therefore it can only be bagged with great luck and good shooting abilities. In Hungary it can only be hunted during the spring and one hunter may only bag 2 during one rodding. It’s feathers are the finest ornaments a hunters hat can have, showing that it’s bearer has already met this deeply desired bird of the spring forest. Hunting season: At the moment the hunting saeson is closed.